Bird’s eye views of the Áísínai’pi site in Alberta are shown in quick succession. Landscapes of plains are showcased one after the other, crossed by a river and featuring scattered rock masses. 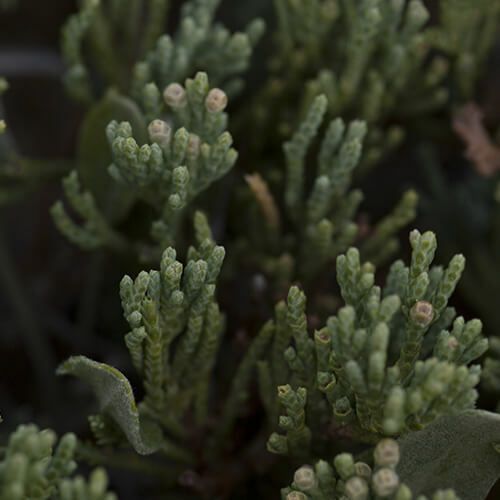 Close-ups of the vegetation and one bird complement the scene. 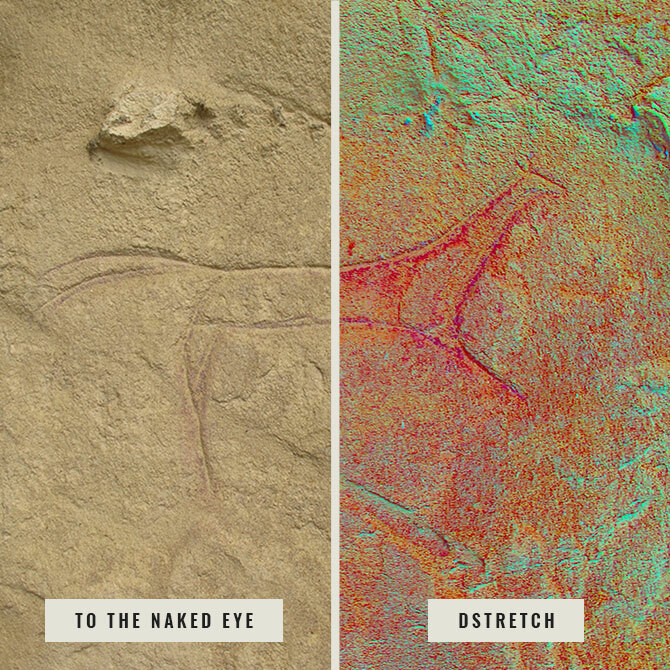 During the video, the shots zoom in closer and closer to the rock walls and their petroglyphs. Next a few close-ups reveal the images carved in stone. 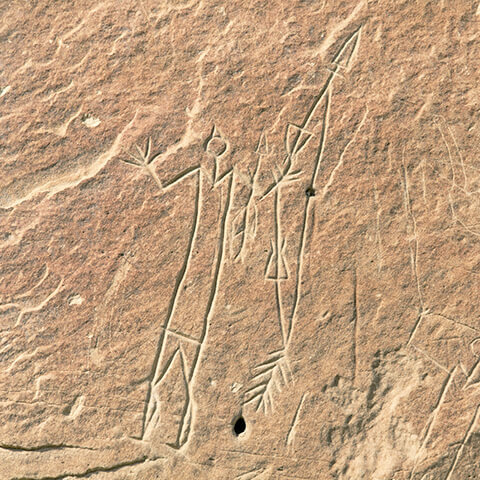 Áísínai'pi, or Writing-on-Stone, is a rock art complex located in southern Alberta that is home to the largest collection of rock art on the Great Plains. Thousands of petroglyphs and hundreds of pictographs have been identified on more than 150 sites. Most are situated in the Writing-on-Stone / Áísínai'pi Provincial Park, a National Historic Site of Canada. 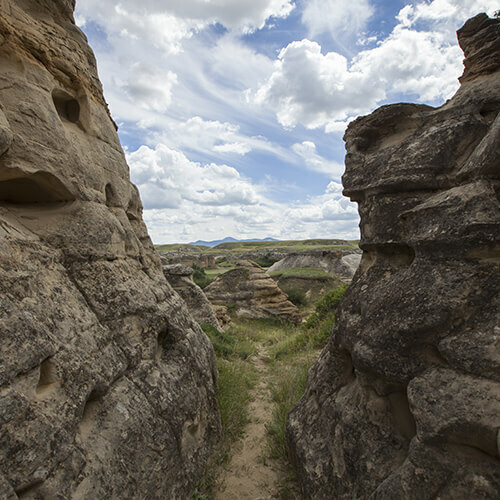 This rock art complex is found in a sacred place within Niitsítapi (Blackfoot) traditional territory. The rock art sites are located in the valley of the Milk River that meanders through the grasslands of the Great Plains. The Áísínai'pi area features high cliffs along the winding river and mystifying hoodoos. 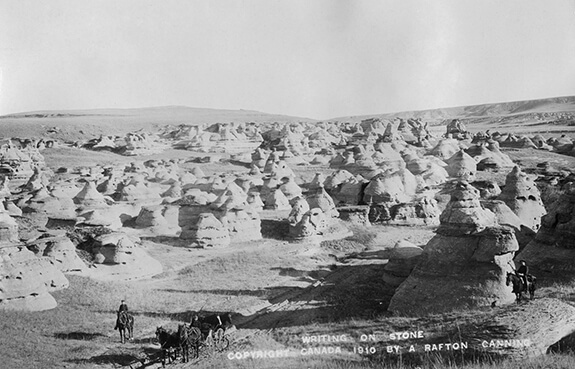 Hoodoos are fantastically shaped brittle rocks eroded by weather conditions and topped by erosion-resistant rocks. The Sweet Grass Hills rising approximately 10 km south, in the State of Montana, complete this spectacular landscape. 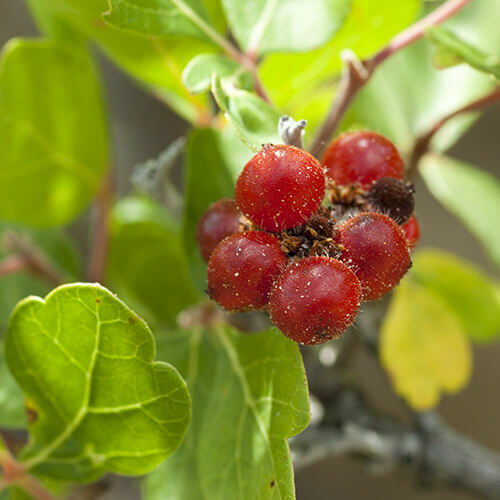 There is an abundant diversity of animal and plant life in the Áísínai'pi area, including riparian cottonwood forests, two species of cacti (Pincushion cactus, or Escobaria vivipara, and prickly pear cactus), silver buffaloberry shrubs and Arctic rosebushes. 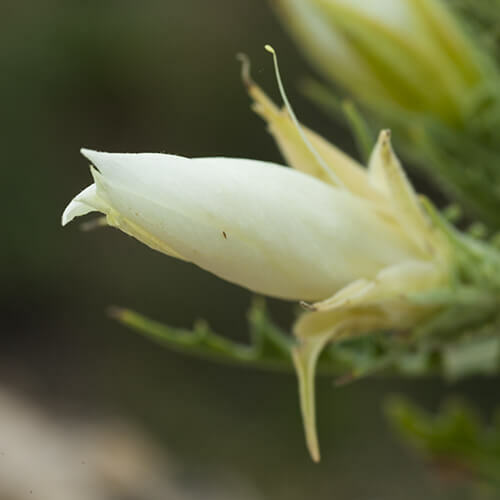 More than 160 species of birds have been identified in the Park, including the Canada goose, golden eagle, prairie falcon, Great horned owl, mountain bluebird and sage thrasher. 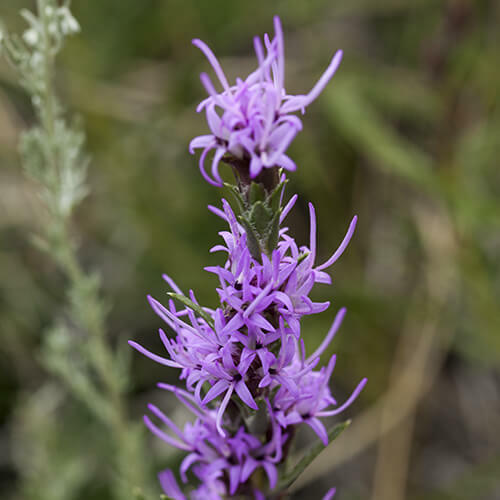 Mammals like the beaver, yellow-bellied marmot, white-tailed deer, mule deer, pronghorn antelope and mountain cottontail share the land with reptiles such as the rattlesnake, Western terrestrial garter snake and Plains garter snake. 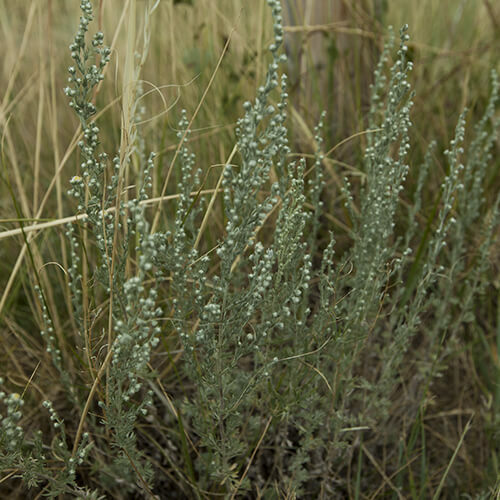 In the semi-arid climate of southern Alberta, there is only intermittent precipitation. Temperatures vary greatly by ±50°C between winter and summer and ± 20°C between night and day. Áísínai'pi is a word in the Nitsipowasin or Niitsipussin (or Blackfoot) language meaning “it is pictured, it is written.” Writing-on-Stone is an English adaptation of this Indigenous place name. 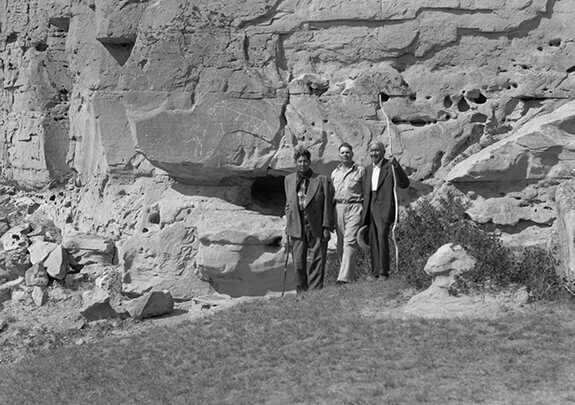 The rock art sites are mainly linked to the Niitsítapi (Blackfoot) and their ancestors, who are members of three distinct nations: the Kainai, Piikáni and Siksika. 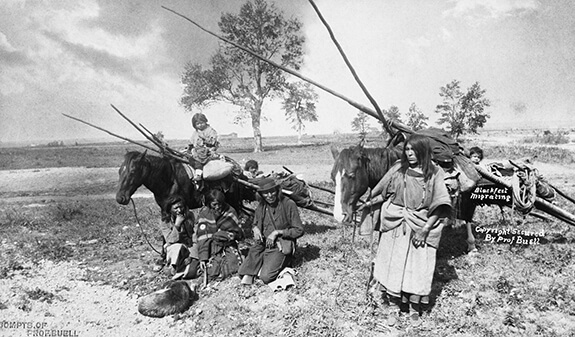 The Niitsítapi are members of the Algonquian family of languages. Traditionally nomadic buffalo hunters, they were also formidable warriors. However, other groups of nomadic hunters like the Cree, Gros Ventre, Assiniboine and Shoshonee may also be at the origin of this rock art. The oldest rock art at this site was created as early as 2000 to 3000 years ago. 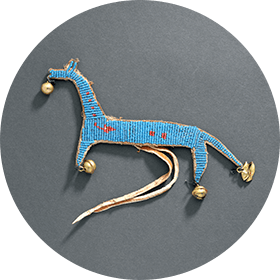 Many of these images date back to the late prehistoric period (between the 3rd and 18th centuries of the Common Era) and several others, to the historic period of the 18th and 19th centuries, as evidenced by depictions of horses and European weapons. The most recent images at Áísínai’pi date back to 1924. More than 150 rock art sites are scattered over a 10 km stretch of sandstone cliffs along the Milk River and the gorges of its tributaries. These are mostly open-air sites, but there are a few isolated sites in caves and rock shelters. Áísínai’pi has always been a sacred place for the Niitsítapi. Their elders attribute the creation of this rock art to the Spirits. The characteristics of the surrounding landscape help to enhance the sacredness of the site. There are two distinct types of rock art at Áísínai’pi: biographic and ceremonial. 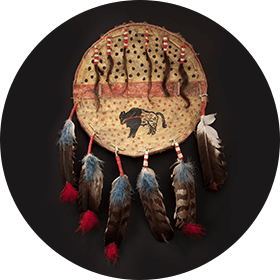 Biographic art tells stories of battles, hunting exploits and horse raids. These images depict action scenes. Ceremonial art is spiritual in nature. It is a form of communication between rock art creators and the Spirit World. Most of these images are static, frontal and isolated. 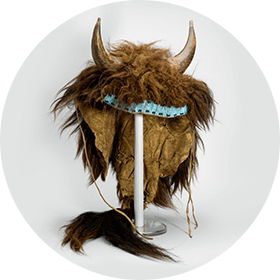 They represent spirits, sacred visions, mythical figures and ritual objects. Guide Camina Weasel Moccasin is walking along a trail and showing rock walls at the Áísínai’pi site. In front of a rock wall featuring several chest-height petroglyphs, she explains and highlights the significance of some of them. Close-ups of some petroglyphs clearly show the details described by the guide. Then the camera follows the guide along another trail that leads to a rock wall featuring rock art at the very top of the rock formation that humans cannot reach on foot. The Thunderbird is a very powerful mythical figure of the celestial world. It lives in a cave, in the mountains. 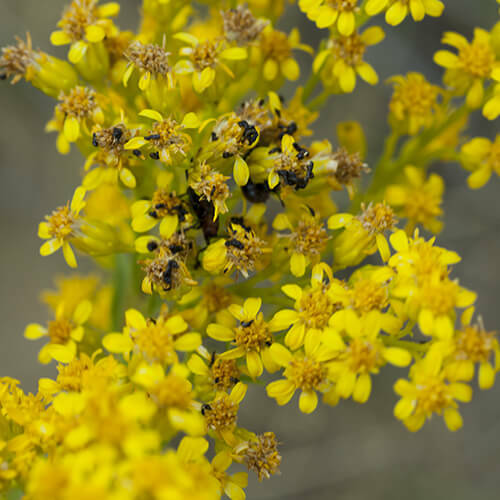 Each spring, it brings about thunderstorms and rain. The bird sets off thunder with a flutter of wings and its eyes cast lightning bolts. The extraordinary power of the bird is well known. 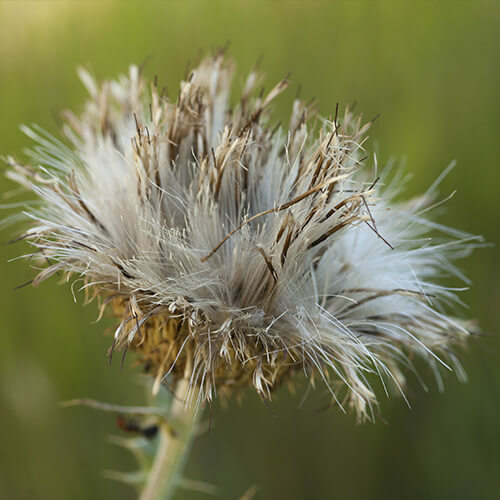 It is often found in Great Plains art. This Thunderbird with a wingspan of over one metre was painted using red ochre on the ceiling of a rock shelter. Here, the zigzag line emerging from the bird’s left wing represents a lightning bolt or its spiritual powers. Rock art found at Áísínai’pi mainly represents human beings. Figures depicted with a V-neck are associated with ceremonial art. These figures are more or less elaborate and some are enhanced with details, such as sexual organs, internal organs (like kidneys) and heart lines. These representations are often associated with objects of material culture. The figures are wearing headdresses or fringed clothing and are holding weapons (bows and arrows) or ceremonial objects. In this image, the figure with arms raised in prayer may be honouring the Spirits and the weapons are symbols of power and strength. Representations of battles are linked to biographic art, a form of art that proliferated during the historical period. This scene illustrates warriors on foot fighting, five of whom are protecting themselves with large, round shields. The two inverted figures on the left probably represent dead fighters. The absence of horses and European weapons reveals that this scene relates one of the rare tales of the late prehistoric period. The horse is the animal most often represented at Áísínai’pi. 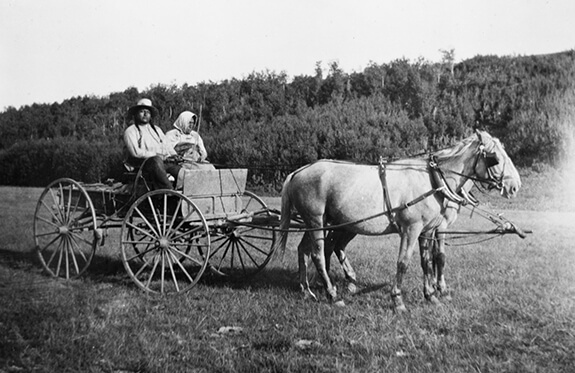 Horses revolutionized transport as well as hunting and war practices on the Great Plains. Endowed with great spiritual power, this animal was honoured during ceremonies. For a warrior to seize enemy horses was considered a prestigious feat. 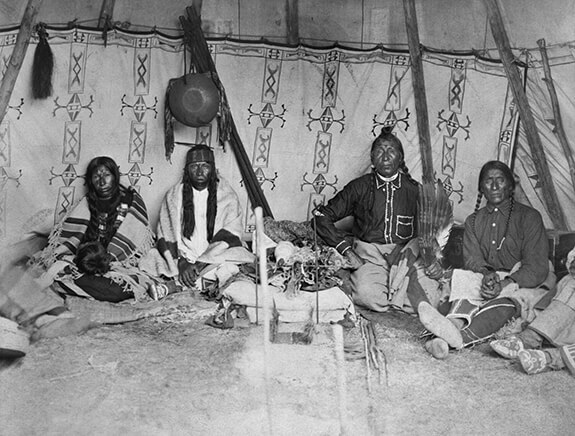 At Áísínai’pi, the three horses, the anthropomorphic figure and the tipi illustrate the tale of a successful raid during which animals were captured. Archaeologist Jack Brink is talking about the Áísínai’pi site and hunting techniques at Buffalo Jump. Behind him is a landscape with abundant vegetation and a river running across the plain. The images of Jack Brink speaking alternate with aerial views of the area showing the vegetation, rock walls and cliffs. The buffalo, or bison, was an vital animal to the Great Plains peoples, both as a spiritual entity and an essential source of subsistence. 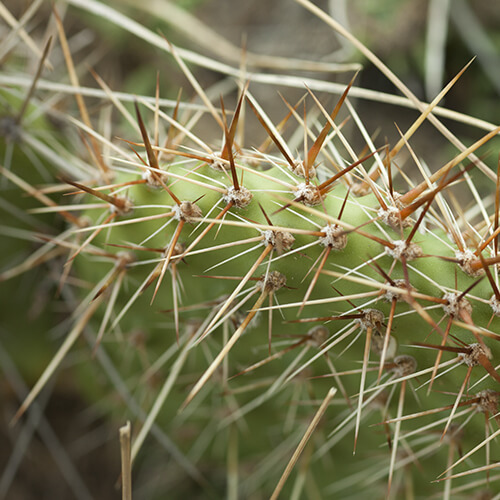 Indigenous peoples used all the parts of the animal’s body for food, clothing and tools. 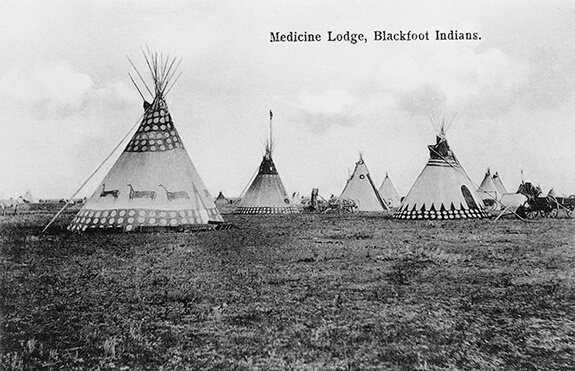 The best-known hunting technique that they used was the buffalo jump. Hunters chased after buffalo herds, driving them towards the top of a cliff where they fell to their deaths below. At the end of the 19th century, intensive hunting by non-Indigenous peoples almost wiped out the buffalo. Jack Brink, Archaeologist and Curator Emeritus at the Royal Alberta Museum, describing a few peroglyphs at Áísínai’pi. 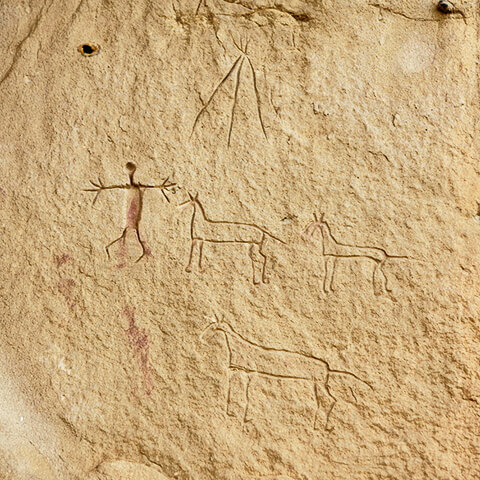 After an view with Jack Brink walking towards a rock wall, a succession of images shows the petroglyph described throughout the video. The video ends with a bird’s eye view of the Áísínai’pi site and its surroundings, a landscape of plains stretching far into the horizon. 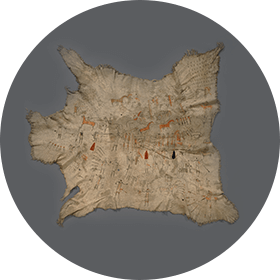 Rock art is part of a pictorial tradition also found on buffalo hides, drums, clothing, tipi covers and warrior shields. Traditionally, these representations were made with mineral and plant pigments. 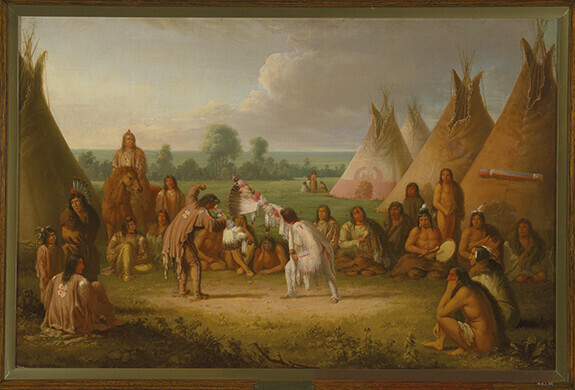 After contact with Europeans, Indigenous peoples continued this tradition by using pencils and ink on new materials like paper, muslin and canvas. 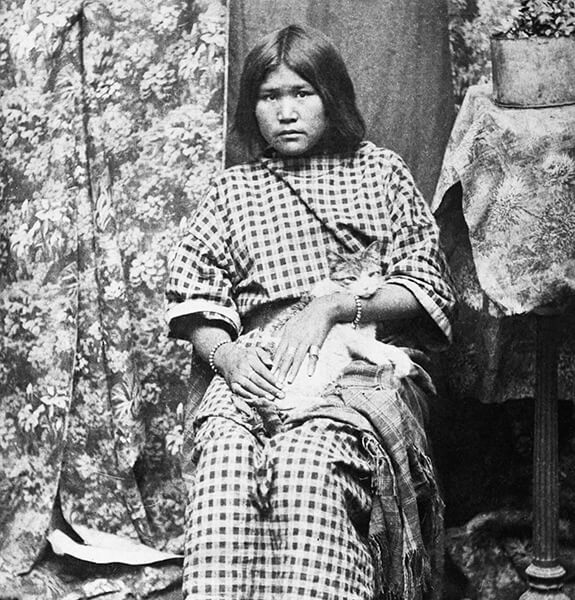 These images feature guide Camina Weasel Moccasin, standing in front of a landscape of plains against an overhanging rock wall. Then, a bird’s eye view of the area shows a peaceful river flowing in the distance. As Camina talks, the camera zooms in on petroglyphs representing vintage cars to illustrate the work created by her ancestor Bird Rattle. Áísínai’pi is where the Spirits dwell, and rock art serves mainly as a means to communicate with them. Some rock formations like the hoodoos and buttes echo their presence. The nearby Sweet Grass Hills, the focal point on the Niitsítapi sacred territory, highlight the spiritual significance of Áísínai’pi. 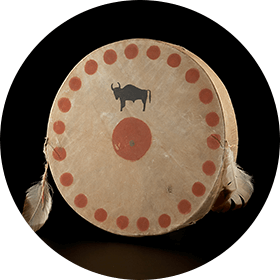 This site remains very important for today’s Indigenous peoples. The rock was incised and pecked to create the petroglyphs, while the pictographs were painted using mainly red ochre applied with fingers or brushes made with feathers or porous bone fragments. Rock art at Áísínai’pi is sensitive to rock erosion, weathering and vandalism. Since the 1990s, the site has benefited from an ongoing surveillance program. Various options to ensure the preservation and documentation of the site have been implemented. 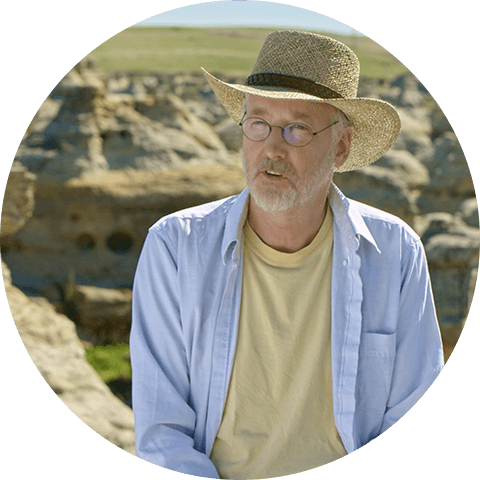 Seated, Jack Brink comments on the condition of the Áísínai’pi petroglyphs and the means to preserve them. He is at the very site where many rock formations rise behind him. 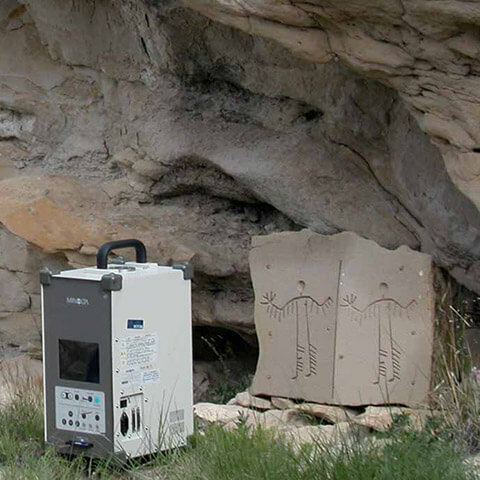 Documenting rock art at Áísínai’pi was made possible with the specialized DStretch software. 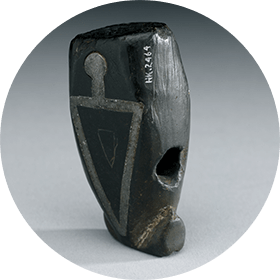 This tool enhances faint pictographs and reveals those invisible to the naked eye. Such was the case with this figure, which appears to be dancing. Its existence was unknown until it was revealed using the DStretch software. Some petroglyphs at Áísínai’pi were enhanced with red ochre. This is a rare practice in Canadian rock art. Through a detailed examination and by using DStretch, researchers revealed the red ochre used to colour the carved lines of this horse. Conservation efforts to preserve the Áísínai’pi site are many and various. 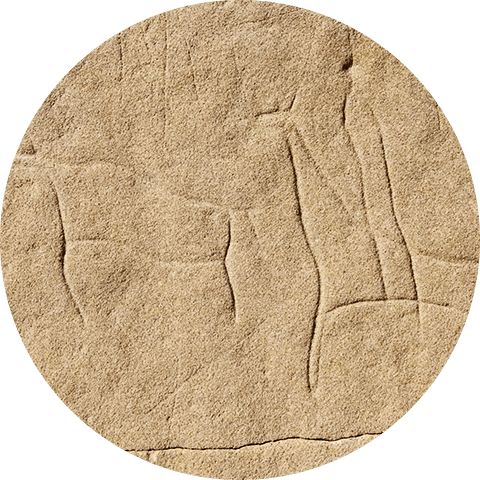 This picture features two reproductions of a petroglyph created on sandstone. One of the two panels was treated with Conservare, a chemical product used to solidify rock. The two panels were scanned at regular intervals over several years to produce accurate 3D scans. 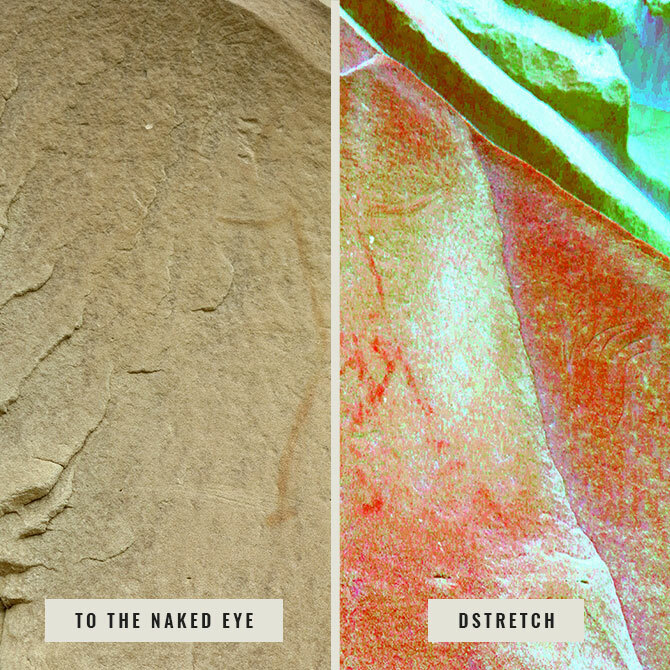 Thanks to this process, changes in the images and rock erosion were noted and compared to measure the effectiveness of applying this chemical product to preserve rock art. 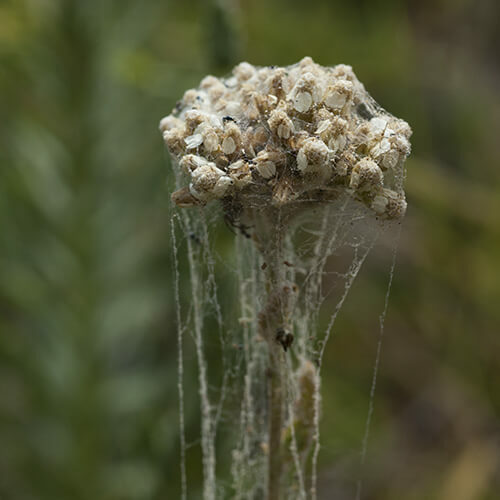 Bird Rattle (ca. 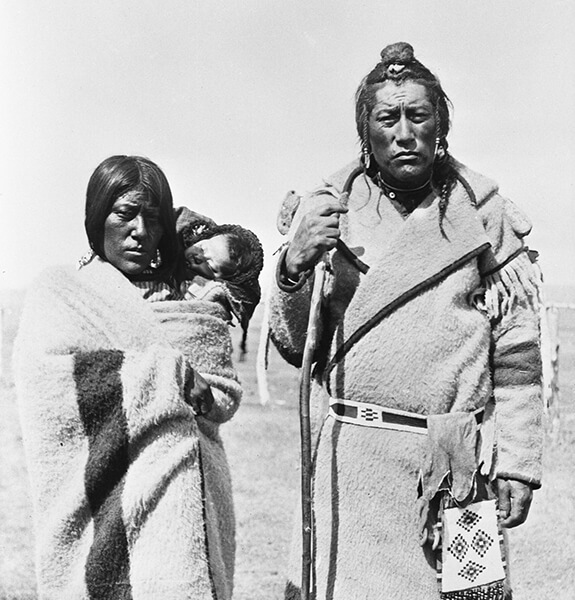 1861-1937) and Split Ears, two Piikáni elders, journeyed to Áísínai’pi in September 1924 with American travel companions. 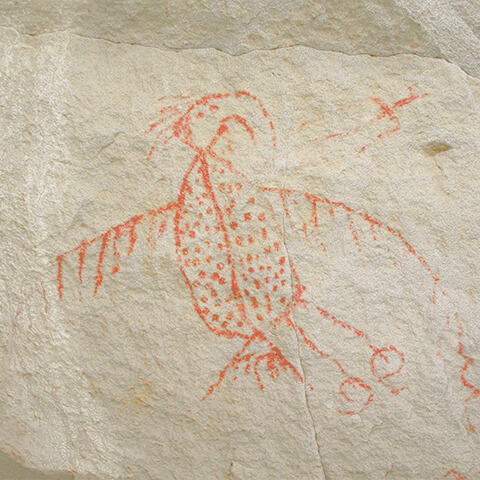 During their stay, Bird Rattle explained that the rock art images at the site conveyed messages from the Spirit World to warn humans about some danger, show the location of buffalo and predict future events. To commemorate their significant visit to this sacred site, Bird Rattle carved two cars with passengers on a road. This gesture clearly shows continuity of the biographic rock art tradition and the ongoing importance of this place for the Niitsítapi. [Park guide Camina Weasel Moccasin walks on a path with a stick that hits the ground] My name is Camina Weasel Moccasin, and I am a visitor experience programmer here at Writing-on-Stone. [She stops in front of a cliff] Ok, so here is a panel where we have a lot of different things going on. [She points with her finger at the first carving] We have some V-neck human figures here, and then, right next to that one is another type of human figure [Close-up of an image with three carvings] which we call Square Shoulder, [Shot of Camina with a slightly moving camera] and the body of that individual is more of a rectangular shape. Now it sets this one apart from the rest. [The guide shows more details with her finger] Also if you look at the head, this one actually has more of an arch, [Close-up of one of the three figures] where as this one there is a definite neck, and a full circle for a head. There’re also spokes that radiate from that arch, and there are also eyes placed into there. [Dynamic shot of Camina] So traditionally, when Blackfoot people made dolls for young girls, we never put a face on them, and the reason is we believe that if it had a face, then that meant it contained a spirit as well. So that same understanding is transferred over to how we interpret the rock art. [Camina shows some motifs with her hand] So I’ve been told by Elders any time I see a human or even an animal figure that has eyes placed into it, it’s depicting a spirit of some sort. So, for this animal figure here, some people think it might be depicting the spirit [Camina traces with her finger the outline of another carving. 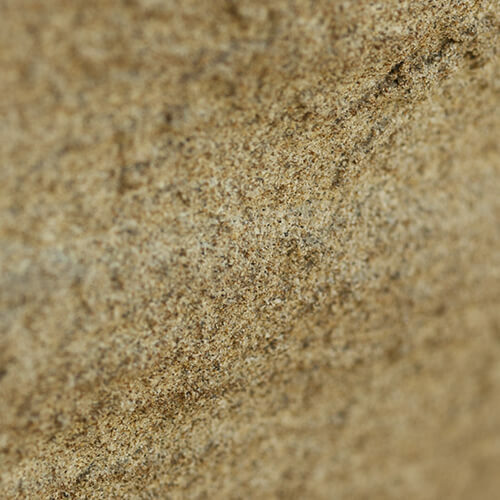 A close-up of the image appears] of an ancient type of horse that lived here at one point. [Shot of Camina with a slightly moving camera, followed by a still image of another figure] We also have this interesting figure here, and I always have a lot of fun asking people what they see when they look at that one. [Shot of Camina with a slightly moving camera] Because of your cultural background and your personal background, that’s going to affect how you interpret these images. So, when people look at it, they think they’re looking at a fish, and… traditionally Blackfoot, we were not fish eaters, so this image was actually explained to me as being a map. [Camina traces the outline of a carving that has two triangular shapes resembling canid ears] So we have these two peaks here, which they say are the peaks of Katoyisiks, [Wide shot of the surrounding landscape: mountains in the distance and, in the foreground, an expanse of Plains, a river and rocky outcrops] which can actually be seen off in the distance in that direction there. Katoyisiks, they are known as the “Sweet Grass Hills,” but that is actually a mistranslation, they should be the “Sweet Pine Hills.” So they say these are the peaks of Katoyisiks. [Close-up of the same figure] These lines here represent this river valley that we are in now, and these two pockmarks that look like eyes, they are denoting some place on the geography where something significant had happened. [Shot of Camina] What exactly that is, we’re not sure, but we know it was obviously something important enough for the people to come and record it on the stone here. [Camina points with her finger at another figure] We have another human figure here, and these ones are called “hourglass” for obvious reasons. [Close-up and still image of the figure] There are some people who think that this might be representing a female body, [Shot of Camina tracing with her finger the outline of another figure] because it tapers in at the waist and then widens out again. That is all conjecture though, there’s really no way we can confirm or deny that. However, this one you will notice it actually has this big arch that goes over the entire body and some people think that this is somebody who has come here for a vision quest, and then they’re depicting themselves after the fact. So often, the direction back that way, there is a natural hoodoo formation, which we call “Table Rock,” and that is a vision quest site. So, basically it’s an area where you sit for four days and four nights with no food or water, and the entire time you are meant to be praying. So yeah, we believe that this is somebody who has just completed a vision quest, and the arch is then representing their aura or their spirituality after the fact. [Camina points with her finger at a place not shown on camera] There’s also some pockmarks here, which are in a very interesting pattern, and this is actually depicting a constellation. [Close-up of the figure] We are looking at the Big Dipper, which the Blackfoot call Ihkitsikammiksi, which means “The Seven Brothers.” [Camina moves her finger across the figure] So, we have one, two, three, four, five, six, seven stars there, and it’s not a straight line, but the two on the edge, they do point to the North Star. And, an Elder from the Blackfeet reservation had said that these stars behind show up the brightest in the winter time. So we are being told either of an exact time that somebody came here to visit, [Camina walks on a path to show other figures] or an exact time that an event had taken place. [Static shot of Jack Brink. In the background are the Plains and Hoodoos] My name is Jack Brink, and I’m the curator of archaeology at the Royal Alberta Museum in Edmonton, and I’ve been working here at Writing-on-Stone for almost forty years now [Aerial shot following the course of the Milk River], working on archaeology and studying the rock art here. 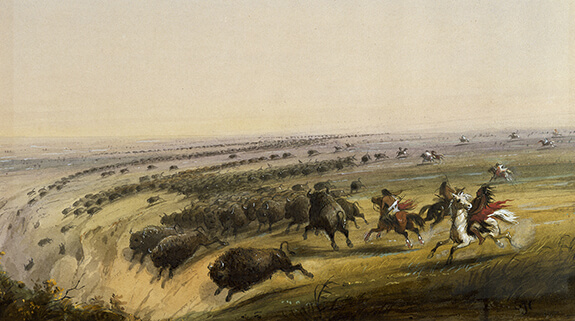 [Jack Brink, standing in front of the Milk River’s surrounding landscape] Millions and millions of buffalo used to roam the Plains here before they were almost exterminated, and so the Plains people found ways to kill them in mass numbers. [Close-up of the site's vegetation, including wheat] And even while they were doing that, they really never endangered the population, because there were so many buffalo that they would never run out [Aerial shot of Áísínai'pi surrounding environment], really, in the traditional ways of hunting them. And the most famous of those techniques is what’s called the Buffalo Jump. The Buffalo Jump was not really a jump [Jack Brink, standing in front of the surrounding landscape], it’s kind of a bad name, [Jack Brink gestures with his arms and hands to illustrate his statements] because the buffalo didn’t jump over a cliff. They were pushed by the animals that were following behind them [Aerial shot of Buffalo Jump] as they ran in a great stampede towards the cliffs. And then you had to move them. And to do that, the native people not only used themselves, but they manipulated the landscape. [Shot of Jack Brink. He gestures with his arms and hands] They would build these stone lines in a V shape like this that would come to an apex right at the Buffalo cliff. 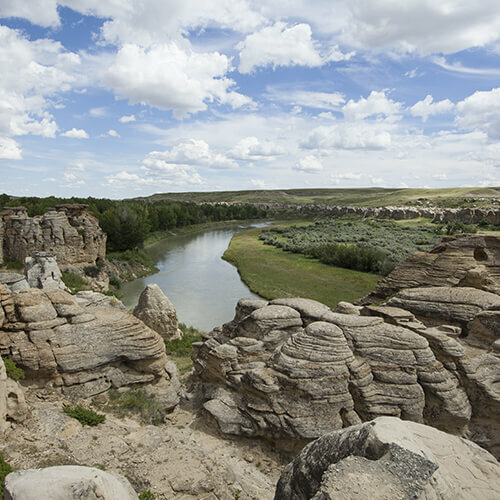 [Aerial shot moving towards the cliffs at the edge of Milk River] And it’s these cliffs at the edge of the river that form the actual Buffalo Jump. [Shot of Jack Brink. He gestures with his arms and hands] In some cases there’s a sheer drop, and in many cases it’s actually just a very steep slope. All the organic material that comes from many, many, many dead buffalo that happened over many different events, and the animals decay in the ground, and parts of them rot, and that’s partly why this is so green right here. [Aerial shot of Buffalo Jump panning out towards the sky] It's because this is a buffalo Jump and we're seeing the results of that even hundreds of years later. [Jack Brink walks on a path surrounded by Hoodoos. He walks towards a rock face] So you would think it would’ve been drawn more often, but surprisingly there is not very many of them. But this is one of them, the better ones and more beautiful ones. It’s a very clear image ... there’s a buffalo or bison in front, [Moving close-up of a rock face and its carvings] you can see the hump on the back, which is characteristic of the animal, and two very tiny little curved horns coming off the head, [Static shot of a carving of a horse rider chasing a bison] and the animal seems to be in motion with curved legs. And then, right behind it is a horse, and the horse has a rider, whose legs you can see on both sides of the horse. The horse is in gallop after the bison, and behind the head of the stick figure who is riding the horse, are these long trailing lines. 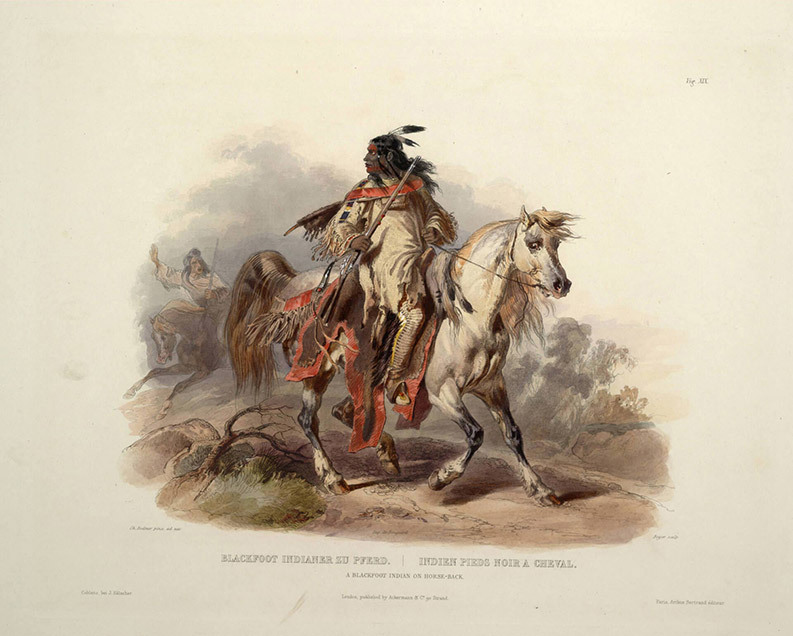 They probably indicate a flowing headdress or some kind of clothing that is streaming up behind him as he gallops, [Moving close-up of the same figure] chasing this buffalo. [Camera moving across the same figure] So it’s a very iconic scene, very classic, and surprisingly, [Low-angle aerial shot over the Hoodoos] it’s not very common at Writing-on-Stone, there’s not very many of these. But this is one of the most beautiful scenes. Obviously, it tells us that it’s [Aerial panoramic view of Áísínai'pi, with camera panning out] after the time of contact with Europeans, because of course before that, there were no horses here. The Europeans brought them in, [Camera moving quickly across a portion of a cliff and then pointing to the sky] and Native people quickly adopted them. So we know this was done sometime after about 1750 or so. 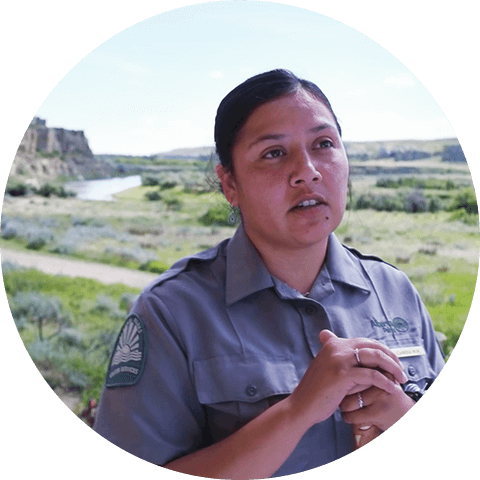 [Park guide Camina Weasel Moccasin stands in front of a Plains landscape, dominated by a rock face] Áísínai'pi is the Blackfoot word for “Writing-on-Stone,” [Aerial shot overlooking Hoodoos. In the distance, Milk River] and it means “where the drawings are”. 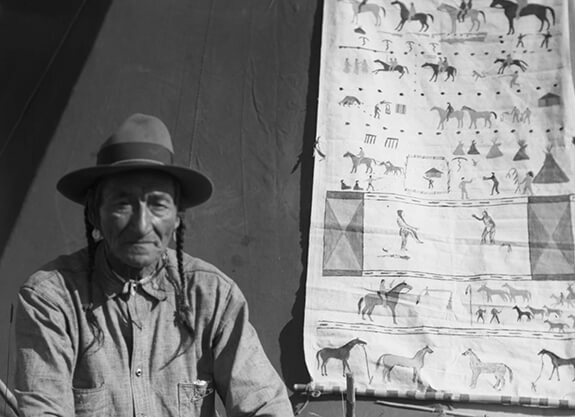 [Shot of Camina] The Blackfoot people have been visiting this place for time immemorial, [Close-up of the guide who stands in front of a Plains landscape] and it’s a very sacred and significant place for the Blackfoot people. There is evidence of our ancestors visiting here for thousands of years, and that evidence is all the rock art that has been left behind. 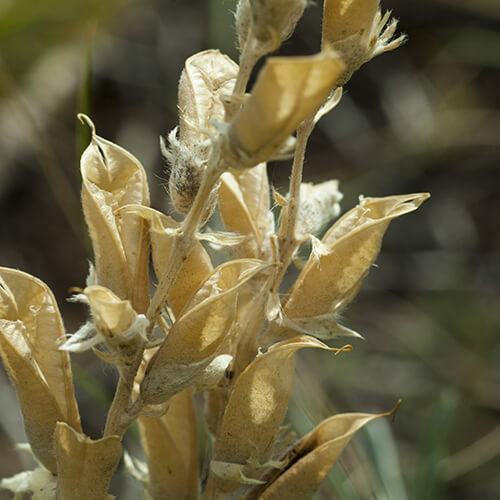 A lot of people who come here… it’s very much a spiritual place, and so it’s believed that there is spirit in the sandstone that is here, there is spirit in the plants that grow here, and in the animals that live here. [Park guide Camina stands in front of a Plains landscape, dominated by a rock face] So, as a child, I never really heard much about Writing-on-Stone, Áísínai'pi. The first time that I can recollect hearing about this place I was already a teenager. So I was sixteen the first time that I came to Writing-on-Stone with my father and one of my brothers, and my father was taking us to go see the Thunderbird cave. And I still remember how I felt coming over that ridge and seeing the hoodoos and the landscape unfold before me, and it’s something that… I’ll forever remember that feeling of first being exposed to this place, and it’s pretty amazing. There was an immediate connection that I have felt. Some of the images… seeing them, and they would just spark a memory of oral tradition or oral history that my father had shared with me about my ancestors. So, seeing the image of a prairie chicken makes me think of my great-great-grandfather Striped Wolf. 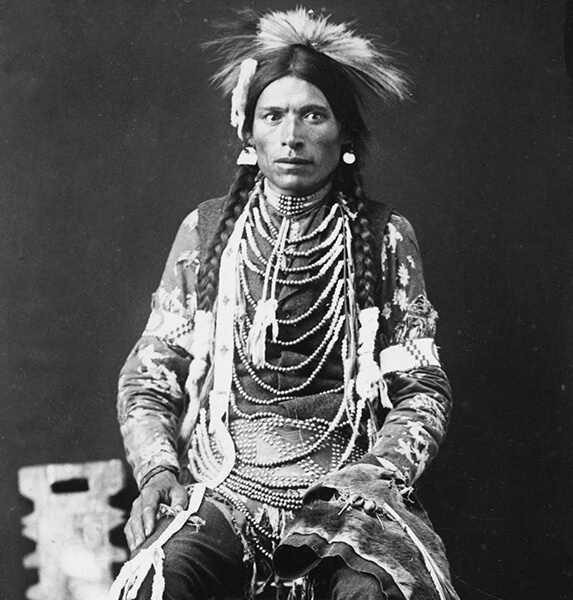 He always wore prairie chicken feathers in his hair. [Camera shot zooming onto Bird Rattle carvings] Seeing of course Bird Rattle’s rock art with the Model T Fords, automatically thinking of that connection that I have with him. [Another shot showing Bird Rattle’s rock art] When I had first heard about Bird Rattle, [Static close-up of the guide Camina] and I went home and I was sharing the story with my parents, my father had informed me that somewhere down our lineage we share an ancestor. So, it is very personal, and it’s something that is very deeply rooted, and I feel that that is much bigger than me as an individual… It’s very hard to explain, but there’s all of that, and much more that is… that can be felt when you come here. [Jack Brink, sitting in front of the camera, tells us about the threats to the rock art heritage at Áísínai’pi. 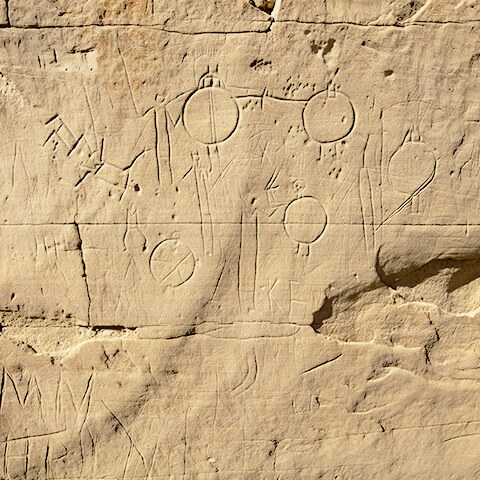 In the background are the Plains and Hoodoos or Sacred Rocks] Writing-on-Stone, like all rock art sites, is falling apart. The rock art here is falling off the cliffs, it’s eroding, some of it slowly, some of it quickly. And of course there’s a large group of people, including myself, we’re interested in: are there ways that we might be able to preserve or at least lengthen the lifespan of some of the rock art here. It’s a very, very difficult thing to do, because this is an outdoor site, it’s very soft sandstone, it’s easily eroded, there are many active forces here: wind, rain, frost, ice and snow, and water, all eroding rock art at a rapid rate. I think there are some things you can do, and I’ve been doing experiments here for about fifteen years now, trying to look at ways that we might at least slow down some of the erosion of the rock art. But even if we discover ways to do that, we have some other significant issues we have to address, and that is: do you do that? Do you go ahead, and actually interfere in some way with natural processes. And there is really two sides to that. There’s people who say “rock art is meant to disappear, you should just always leave it alone,” and there’s another group that says “but that means future generations will never see it.” And so, if there are some ways that we can help extend the lifespan of that, we should be doing it. And I think getting agreement on that is going to be a very challenging thing. All I can do as a scientist is I’m trying to prove that there are, or are not, ways that we can conserve rock art, and make sure that if we do something to the rock, that we are only ever doing something that is in itself, no additional damage to the rock, because it’s probably going to be something that cannot be reversed.